Jackie has been a dedicated volunteer at our Mt. Mercy Dining site for three years now. 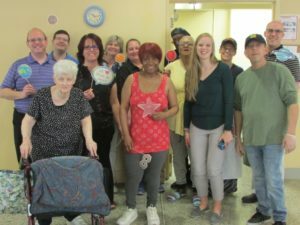 Just one week after she moved into the apartments, she decided she wanted to become a volunteer and help out her fellow residents at the dining center. Jackie volunteers Monday-Friday, she helps with just about everything, too. Site Coordinator, Melissa Gully says, “she is so faithful to be here every day. I could not do my job without her. She helps put the food together and adds a special touch of expertise to the meals. She is always willing to help in any area needed from cooking, serving, cleaning, washing dishes, making coffee, serving those who need a little extra help, and bussing, cleaning tables and rolling silverware”. After just the first few minutes of speaking with Jackie, it was evident that she has a heart for people. When asked why she volunteers with Meals on Wheels at the site, she quickly replied, “I love being around people, I love to serve people, I love to help everybody, I just love everyone.” And it is clear that everyone loves her too. Everyone knows Jackie at Mt. Mercy, they are her friends and the people she spends much of her time with. She loves to see everyone happy and enjoying their food, “this is our happy time,” she says. Jackie was born in Ohio, lived in Mt. Clemens, Michigan for ten years, and Port Huron for thirty years. There she got married and had 6 children, with now 20 grandchildren and three great-grandchildren! Jackie has always been a hard worker, she was a CNA for 35 years, and ran a cleaning business in Port Huron before moving to Grand Rapids. She loves to crochet, she makes clothes for her grandkids, she also knits and sews and just recently started singing in her church worship and praise service. 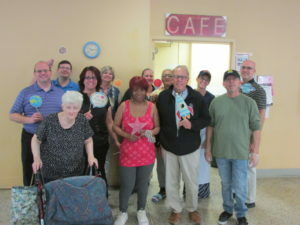 Jackie is such a caring and dedicated person, she is there for her children, whenever they need her and is there for her fellow residents and friends at Mt. Mercy too. She can always be counted on, even when she is in pain from a recent injury. Melissa says, “she broke three ribs this year in a fall at home but continued to faithfully be here every day even while in pain! She cares about the residents and it is evident in the servant’s heart she shows to all of those around her. She brings a bright positive spirit to all of us who work here at the café!” Jackie also babysits her 7-month-old grandchild on Fridays, yet still amazingly volunteers on those days as well. We are so thankful for Jackie’s commitment to our program and so grateful to have her as a part of our team. We appreciate her, and others like her who give so generously of their time to reach seniors in our community. Thank you, Jackie!